It would be good if the USA would put some money into developing a high-speed rail system. Shift some money from the bloated military budget. Maybe the US could catch up with China if officials worked on things to help the people. Meanwhile American trains are the creaky old Amtrak with nineteenth century technology. What a shame. By the way, Turkey also has high-speed rail trains. 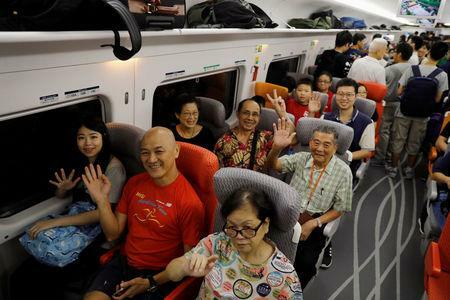 HONG KONG (Reuters) – Hong Kong’s controversial bullet train got off to a smooth start on Sunday, as hundreds of passengers whistled north across the border at speeds of up to 200 kph (125 mph), deepening integration of the former British colony with mainland China.